We are reminded that there is a difference between calling for justice and calling for peace. Twenty sixteen was a banner year for political athletes. Some of the most celebrated people in sports used their hyper-exalted, brought-to-you-by-Cialis platforms to speak out about a crisis-ridden world. But there was also a little-remarked-upon division among athletic truth-tellers: It was the difference between those who were calling for peace and those calling for justice. Go back and read the statements by LeBron James and friends at the ESPY awards and then read the words of Colin Kaepernick and Megan Rapinoe. There is a difference—it’s the difference between a call for unity and a demand for action. Both demands, especially today, are admirable, but we should recognize the divergence. Similarly, we should recognize the difference between the motivations that are now spurring white NFL players to—at long last!—take part in the anthem protests for justice. Oakland Raiders quarterback Derek Carr, to much fanfare, put his hand on teammate Khalil Mack’s shoulder on Saturday, who stood during the national anthem. 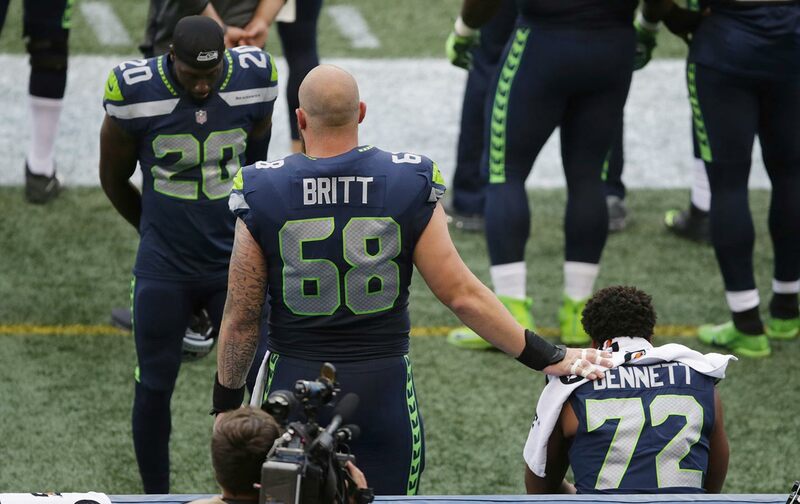 Seattle Seahawk Justin Britt did the same on Friday, alongside the protesting Michael Bennett, who sat during the anthem. Earlier that week, the Eagles’ Chris Long put his hand on teammate Malcolm Jenkins’s shoulder as Jenkins raised his fist. All three moments make for moving photos and memes. But the differences between Carr’s motivations and those of Britt and Long matter. Chris Long was also standing with Malcolm Jenkins, a player who was raising his fist because the “criminal justice system is still crippling communities of color through mass incarceration.” Long was repulsed by the events of Charlottesville, his hometown, and wanted to tell the world. None of this is at all to criticize Derek Carr. I wish every white player, in these times of Trumpian division, would showcase unity with their black teammates. It is, however, important to recognize the gap between calling for peace and calling for justice. One comes with a great deal more risk, a risk that Chris Long and Justin Britt have decided to take on, making the burden on their protesting teammates a little bit lighter and helping the all-important message that Jenkins and Bennett are trying to convey travel a little bit further.